One of the unsung stars of the hit TV series ‘Rebellion’ will be featuring at the AXA National Classic Car Show. Organised by the Royal Irish Automobile Club the event in the RDS runs on March 5th and 6th. The Model T was the first mass produced vehicle in the world and was the brainchild of Henry Ford, a grandson of Irish emigrants to the USA during the Famine. This Irish American entrepreneur wanted to produce a vehicle that would be affordable for all. As he said in his own words: “I will build a car for the great multitude. It will be large enough for the family, but small enough for the individual to run and care for. It will be constructed of the best materials, by the best men to be hired, after the simplest designs that modern engineering can devise. But it will be so low in price that no man making a good salary will be unable to own one”. By 1914 over fifty percent of all cars sold in the world were Model T’s and many had found their way into Irish ownership. During the 1916 uprising in Ireland many of these vehicles were used in different roles during the fighting. 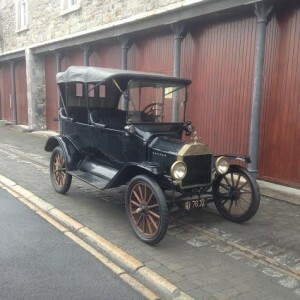 The Ford Model T Car appearing at the RDS show has featured in nearly every episode of the hit RTE TV series Rebellion. The Ford Model T was designed by Childe Harold Wills, and Hungarian immigrants Joseph A. Galamb and Eugene Farkas. Production of the Model T began in the third quarter of 1908. It had had a front-mounted 177-cubic-inch (2.9L) inline four-cylinder engine, producing 20hp, for a top speed of 40–45mph (64–72km/h). By 1914, the assembly process for the Model T was so streamlined it took only ninety-three minutes to assemble a car. Incredibly for the time, at the height of production there was a finished vehicle ready to be shipped out every three minutes. That year Ford produced more cars than all other automakers combined. The Model T utilised some advanced technology including vanadium steel alloy whose durability was exceptional and today many of their parts remain in running order nearly a century later. On May 26, 1927, Ford Motor Company ceased US production of the most successful car of its time. For spectacular displays of truly amazing classic cars and entertainment for all the family, visit the AXA National Classic Car Show on Saturday 5th and Sunday 6th of March 2016, 10am–6pm each day.